Did you know that of the 500,000 elected offices, only 22% are held by women? If elections continue at the current pace, gender parity will not be reached for another 100 years…but not if Anne Moses has her way. Anne, the Executive Director of IGNITE, is fiercely working to accelerate the path to elected parity for women. She is shining a light on the canard that female candidates for non-federal offices are treated differently and is encouraging young girls to run for office. Anne, a native New Yorker, is an only child of television journalists who traveled extensively and internationally (her dad was with Sixty Minutes and her mom with 20/20). She graduated from Middlebury College in in 1988 and launched her professional career as an editorial assistant with Random House. She lived with a small commune in an even smaller apartment. Disenchanted with the glamourous life of a newspaper clipper, Anne quit, became a cocktail waitress in the West Village and took on various volunteering opportunities to build a resume towards an MSW degree at NYU. She then worked in NYC as a therapist before moving to California where she earned a PhD in Social Welfare from UC Berkeley. Anne worked on a study of teen abstinence that definitively proved that abstinence was ineffective in preventing teen pregnancy. She later served as a research director for a small nonprofit and a grant writer for a think tank run by Stanford economists. 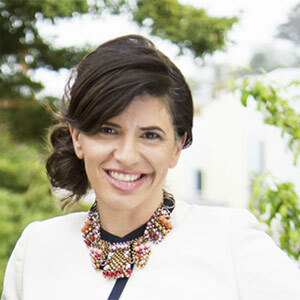 Due to her grant writing expertise she was hired to be the first Executive Director of Girl Source, an employment and training organization for women and girls. In five years she grew Girl Source from $200K to $1.1M, surviving a recession. While serving as a fundraiser for EMILY’s List, Anne concluded that the most effective way to solve the inequities faced by women was to elect more women. Bucking the odds, Anne launched IGNITE in 2008 during the worst economic downturn since the great depression. Anne worked for almost two years without drawing a salary until winning a significant grant from the Boone Family Foundation,. Like Anne, IGNITE punches above its weight. Despite operating on a budget of only $1.5M, the organization leads the conversation on solving the problem of underrepresentation of women in politics. IGNITE has a number of success stories. One of Anne’s favorites is that of Carshell Green who joined the IGNITE program at Leadership High school in the fall of 2015. In November, Carshell met Attorney General Kamala Harris while attending an event with other IGNITE participants. During her initial conversation with AG Harris, Carshell shared her experiences as a young Black woman in foster care and her interest in changing the systems that hold at risk youth back. AG Harris was so impressed with her conviction that she offered Carshell an internship in her office, and during the month of May Carshell traveled to San Jose to participate in planning Harris’ Senate campaign strategy. In her spare time, Carshell also volunteered for Hillary Clinton’s primary campaign. 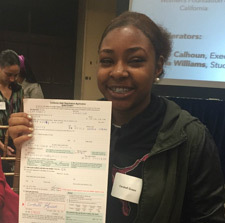 Carshell recently graduated from high school and will be attending Mills College in the fall where she’s eager to launch an IGNITE Chapter for other politically motivated young women. It appears that we can look forward to hearing more success stories from IGNITE, Anne and Carshell. My parents thought the last name Moses was too ethnic to pair with anything fancy, so they gave me the plainest first name possible, and no middle name (which I was always a little sad about). Consequently, my children have more unusual names: Violet and Dalilah Buffalo. (Buffalo is my husband’s last name, so they came by that one honestly). I don’t think I ever really knew. I was always that kid who was upset about the wrongs of the world and so social activism was naturally appealing to me, but I never saw any jobs that were in that realm, so it never occurred to me that it could be a career opportunity. My parents were both journalists and so that was the only way I saw the possibility of social activism – through the lens of reporting on it. And of course because my parents did that, I never wanted to, even though it seems pretty interesting to me now. I love what I do now, but if I could change something dramatically in my life (with money as no object, which of course it always is), I would have a goat farm and make cheese. I know nothing about cheese making, but I like goats and goat cheese, and it sounds very romantic and quiet. Alternatively, a more likely scenario would be professor – for my retirement. I love teaching and would enjoy going back to it. I would have travelled the world for a year or two before I embarked on my career. Book – I’m old school. French or Italian countryside, with the goats. Sadly, the challenges ahead of me always seem to do with raising money, the curse of running a non-profit organization. I have to raise a lot more money this year to bring our programming to tens of thousands more young women across the country. These days it would have to be Hillary Clinton – she’s a flawed candidate, but I think it takes a helluva lot of strength to do what she’s doing with so many people so ardently against her. Every night I have a glass of Armagnac before bed. After the dishes are done, the kids are settled in, and everyone heads off to bed I pour myself a little drink and celebrate the end of the day. Knowing what people are thinking and feeling. I think I would bring one of my colleagues from IGNITE – they would enjoy it so much. That’s such a big assumption that I’m not sure I can stretch my imagination that far!